Probably everybody on earth has heard the name Stephen Hawking. He is the English physicist who became famous for his theories of the universe and for the books that he wrote, among them A Brief History of Time that has sold ten million copies. Stephen Hawking is also famous for something else. When he was still a college student, he was found to have ALS (Lou Gehrig’s disease), a disease of progressive muscular degeneration. He was told he had two years to live, being made to understand that, as his body deteriorated, his mind would be unaffected. When Stephen first discovers that he has ALS, he tries to send Jane away, believing he has no future and nothing to offer her, but she persists. (She takes the idea of romantic love literally.) She will stick by Stephen for as long as he has. (Stephen’s father tells Jane that Stephen’s disease won’t be a fight but will instead be a crushing defeat for all of them.) Stephen and Jane are married and soon have a child. Living with Stephen and taking care of him is not easy for Jane, but she soldiers on through the years as Stephen becomes world-famous and continues to defy the probability that he will die soon. Jane and Stephen end up having three children. A turning point comes when Jane’s mother suggests that Jane join the choir at church. (“That may be the most English thing that anybody has ever said,” Jane says.) She takes her mother’s suggestion and meets the handsome and charming choir director, Jonathan Hellyer Jones (played by Charlie Cox, who played a likeable character on Boardwalk Empire who met a bad end). Jonathan becomes a friend and helper to both Jane and Stephen. Jane soon admits that she has “feelings” for Jonathan and Jonathan feels the same way about Jane. Stephen, meanwhile, is drawn to a pretty therapist named Elaine. You don’t have to understand Stephen Hawking’s science (black holes, the theory of relativity, boundaries of the universe, etc.) 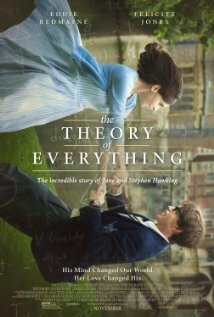 to be drawn in to The Theory of Everything. It’s a very good movie that, like other very good movies, will probably not appear at the local multiplex that only does mainstream. You might have to go a little farther and expend a little more effort to see it, but it’s worth it. If it’s not one of the best movies of the year, it’ll have to do until the real thing comes along.